One of the ironies of being a professional hunting guide is that I you never seem to get enough days to hunt. Our season begins in early May with trail clearing and the first horseback rides of the summer, segues into lots of day rides and pack trips through the summer vacation, and once the last hunting camps have been dug out of November snowdrifts and packed away, it’s Thanksgiving and I’m completely exhausted. My bird dogs stand in the kennels, tails wagging, remembering the great days of scenting blue grouse and ptarmigan in September but wondering when the heck we’re going to go pheasant or quail hunting. This past fall, by the time everything was said and done, I had hunted three days for mule deer and five days for pheasants with my boys. It was not enough. Then providence stepped in and I was invited to go to Kentucky for a quail hunt. I couldn’t say “Sign me up!” fast enough. In late February I found myself at the Nashville airport, met by Lance Tracy, director of SportDog Brand training collars, and enjoying the ride to Evansville, Indiana, with Lance’s English setter, Ripley, in the back seat. The rest of our party was arriving in Evansville, so we checked into the Holiday Inn there. The first to show was photographer Lee Kjos, who shoots most of the images for SportDog and many other outdoor companies. At first I couldn’t quite figure Lee out. Seemingly in his late 40s, he wore over-the-collar Raggedy Andy hair, a snowboarder’s toque and a beaded necklace. His speech was branded with a died-in-the-wool Minnesota accent. But after a few minutes looking over Lance’s shoulder as Lee scrolled through pictures on his laptop, I was convinced that this guy was the real deal on outdoor photography. 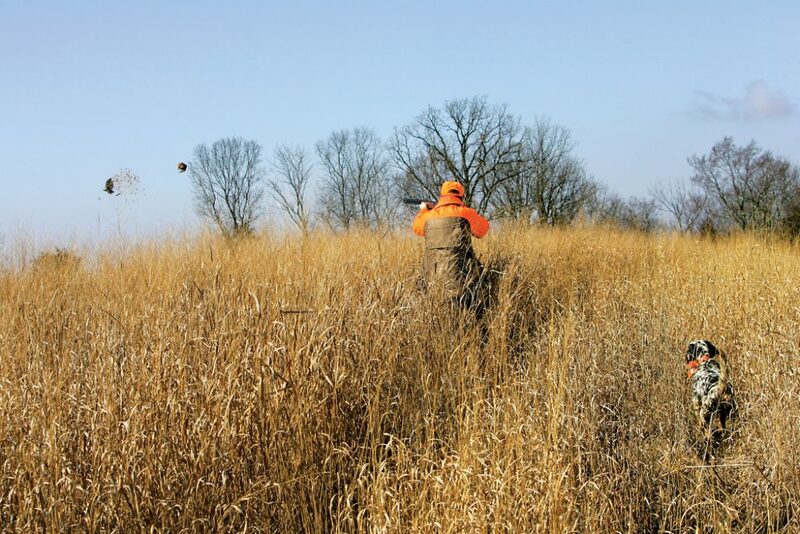 I recognized a couple of Shooting Sportsman covers and saw a bunch of killer shots that demonstrated a deep working knowledge of dogs, birds and shotgunning. 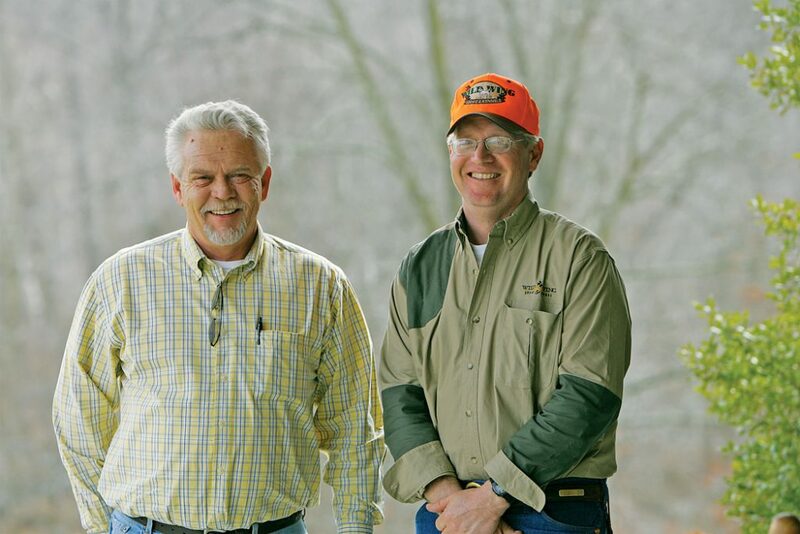 Wild Wing Lodge owners Ronnie Rich (center, left) and Rhett Kermide (center, right) have created a 3,000-acre quail hunting nirvana where they guide small groups of hunters over English setters and pointers. The next morning we picked up freelance writer Tom Davis, a frequent contributor to SSM, and Kyle Wintersteen, associate editor of American Hunter. 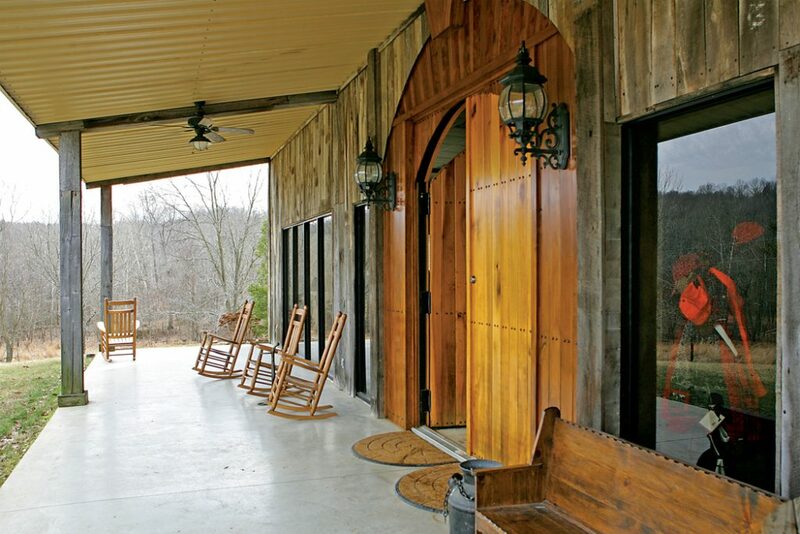 Then we were on our way to Wild Wing Lodge, a 3,000-acre quail hunting retreat near Sturgis, Kentucky. 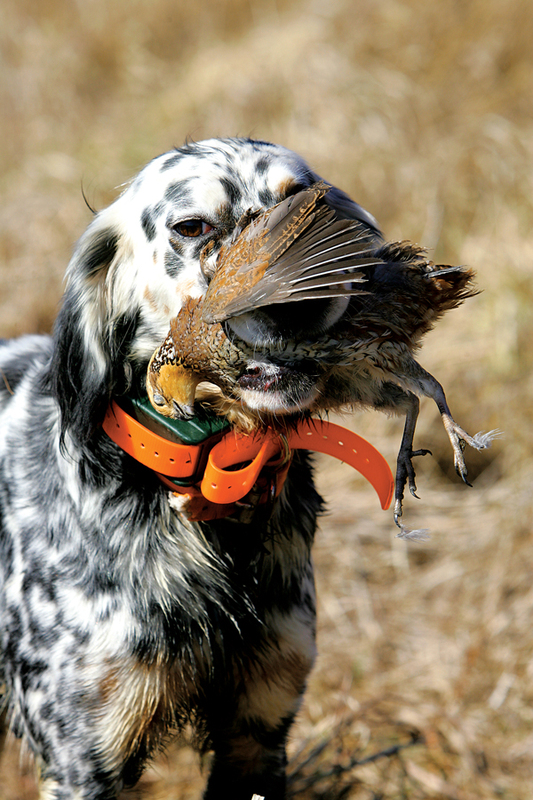 Lodge owner and dog trainer Rhett Kermicle and his partner Ronnie Rich, a retired Kentucky game warden, offer guided quail hunts for small groups of upland enthusiasts over Rhett’s line of English setters and pointers. After we had arrived and stowed our gear, we headed back out for our first hunt. I was paired with Kyle and guided by Rhett. In his early 40s, Rhett is a quiet, serious, confident dog handler, a guy who knows he’s got a great program going. The last time I had hunted quail, I had been on a drought-stricken private ranch in the Texas Panhandle. We had covered mile after mile and found a half-dozen coveys of skittish birds, each hunter bagging five or six birds a day. I was ready to put in the miles and make every shot count at Wild Wing, but after 20 minutes, two coveys and four solid points, I realized I could relax. The topography was a series of low, flat-topped hills covered with open meadows of switchgrass, bluestem and Indian grass, with gullies of hardwoods below. The fields ranged in size from 10 to 60 acres, and from my hay-growing experience, I could see that this country would be hard to plow, fence, seed, harvest and farm. It was much better suited to quail hunting. Rhett’s mother-son pair of English setters, Queenie and Prince, were a study in classic fieldwork as they slammed into points again and again, holding steady as we fired at quick-flying coveys of quail and retrieving to hand on command. After you’ve put in hard days and long miles trying to find a covey of birds here and there, it was surprising to suddenly be spoiled as we were—until it was almost a matter of disbelief. When would it go south? When would the endless supply of birds dry up? 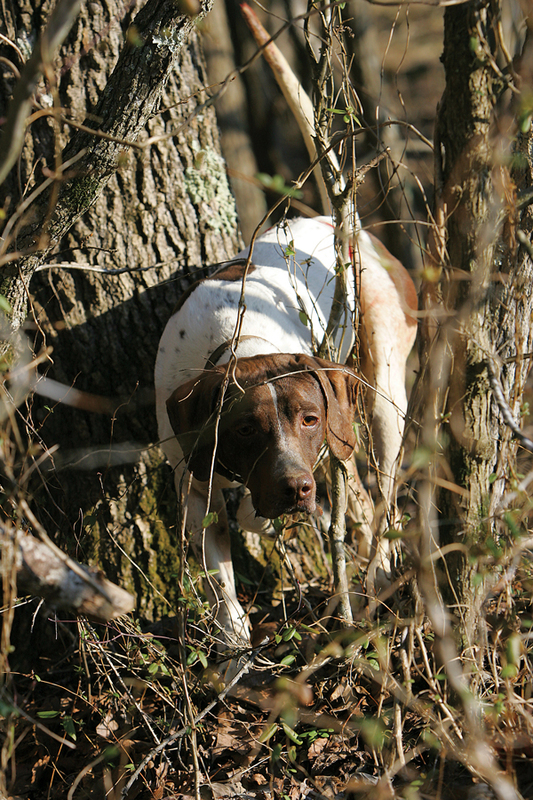 When would we start pounding the creek bottoms and hardwoods trying to scratch up a single or two? Two and a half hours later, we had flushed 15 coveys, and both Kyle and I had dropped eight or 10 quail apiece. I spent equal time shooting pictures as I did quail and handed the gun to Rhett for some action shots. He didn’t disappoint, quickly accruing several birds and filling my memory card with nice photos. It seemed to be too much fun, almost too good to be true. Yes, these were released birds. Yes, this was a “quail plantation.” But every now and then you have to rip loose a little. Covey after covey, point after point, it was a classic experience. The birds kept holding tight to solid points; the dogs kept up a consistent routine of pointing, honoring, being steady to wing & shot, and retrieving on command. If you imagined a quintessential quail hunt to the last detail, this was it. Kyle was living the dream. A handsome, well-spoken young man, he recently had graduated from college and sent a resume to the NRA. The folks there must have liked him, because before he knew it, he was writing about hunting for a national publication. A Pennsylvania native, Kyle keeps a hunting dog in his apartment in Washington, D.C., and tries to get into the field as often as possible; but he had never experienced anything like this. Lots of bird hunting venues put great emphasis on fluff— shiny vehicles, thick bedspreads, hunting art prints, massive great rooms with Alaskan trophies—but as any dedicated wingshooter will tell you, it’s all about the dogs and the birds. If the birds can barely flutter out from under a dog’s nose and the cover is so-so, it’s all for naught. Most guys would rather stay in a dive motel and eat greasy-spoon specials as long as the birds are plentiful and fast-flying, the cover is thick, and the dogwork is solid. I asked Rhett how Wild Wing is able to maintain this kind of quality with its birds. 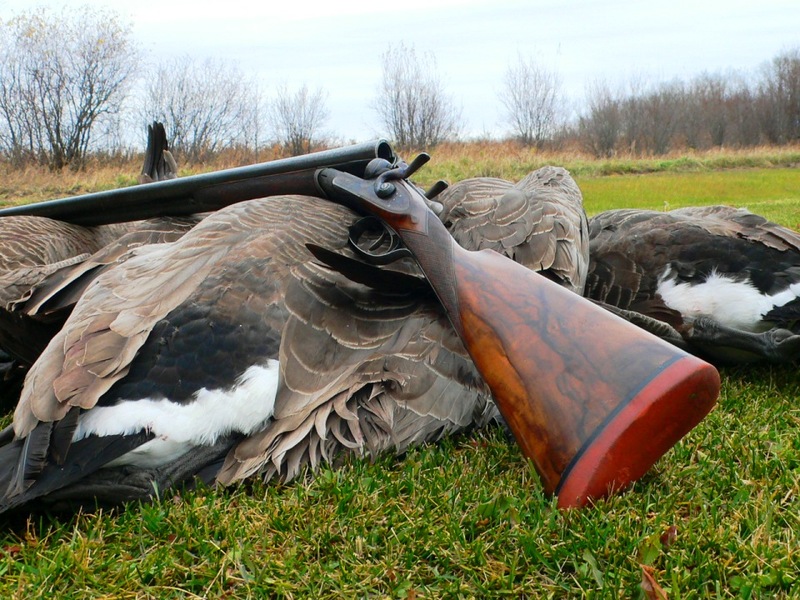 “We do two big releases early in the season of about 2,500 birds each,” he said. “That gets our coveys solidly established. Then we supplement those birds about eight times a season.” The secret, Rhett explained, is to let the birds go wild and then avoid over-hunting the coveys. It wasn’t just the birds, either. The dog- work was as good as I have seen. Rhett kept rolling out all-star after all-star. Queenie and Prince were superb gundogs. Prince, as a three-year-old, was as good a young dog as I have hunted over. In a later phone conversation, Rhett mentioned that he had sold Prince for $6,000, which I thought was a great value for such a well- trained, talented and good-looking dog. In the afternoon Rhett ran Ripper and Champ, a “matched pair” of orange- marked English setters. Again the dog- work was fantastic and we found plenty of challenging birds. That night as we sat around the table sharing stories of our day’s experiences, I wondered how I had come to be so blessed. Of course, with so many guys who had traveled the world hunting birds, the stories were many and widely varied. The highlight was looking at Lee Kjos’s pictures and hearing how some of his photo shoots had unfolded. He had taken some mystical images that morning showing a fast-flying covey of quail bursting through fog in front of the dogs and gunners. Outstanding stuff. I queried Rhett about his dog program. He trains for the public and also breeds English setters, which he works in horseback field trials. In many ways he and I pursue a similar program. I buy three- year-old colts, break them to ride, and then put the young horses to work in my outfitting string. After a couple of years of hard work and lots of trail miles, I sell finished trail horses to the public at top dollar. People are paying for that repetition and experience. Rhett does the same with gundogs. He breeds litters and raises puppies from his own bloodlines, typically running 25 to 30 of his own dogs and about a dozen client dogs at a time, with the help of a couple of assistant trainers. After putting the initial training into a dog, he uses it for guided hunts for a season or two, at which time the dog has pointed and retrieved hundreds and sometimes thousands of birds. Then the dog is ready for the “easy life,” becoming a hunting companion and pet for some lucky family—and Rhett cashes a nice big check. Rhett has been instrumental in the SportDog R&D program, providing tips and suggestions on how to make collars and transmitters more user-friendly. Lance Tracy takes pride in the fact that his designs are generated by dog handlers and hunters, as opposed to engineers sitting in cubicles. Interestingly, I never saw Rhett or any of the guides have to stimulate a dog on our hunt—evidence of the judicious and proper use of collars in earlier training. The next morning I joined Lance and Lee as they photographed Lance’s dog, Ripley, pointing quail. 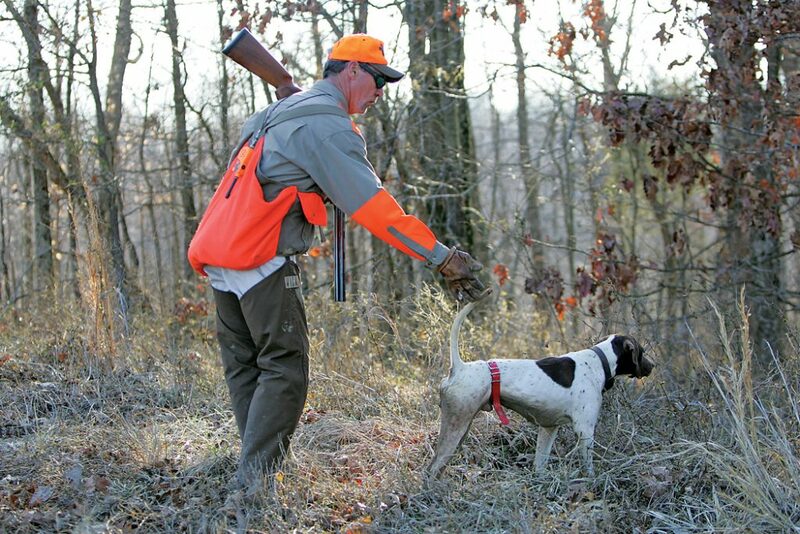 Once the light deteriorated, guide Billy Winstead put a pointer named Booker and a setter named Suzy on the ground, and the fun began again. Lee tagged along with his camera as we slipped back into the rhythm of point, flush, shoot, retrieve. And each time it started seeming a little predictable, something unusual would happen. On one occasion Lance and I tracked two different birds whose flight paths crossed; our shotstrings must have met in the middle as the two birds fell, and neither of us could tell who had downed which. That afternoon Tom Davis and I paired with guide manager L.D. (Larry Don), who has never been accused of being shy and withdrawn. As a guide, L.D. is a true professional, and he has great knowledge of dogs, birds, guns, fish—anything that flies, swims or grows antlers. But be prepared: If you tell L.D. you’re ready to hear a joke, then you’ll soon be laughing hard enough that you won’t be able to get your shotgun reloaded. What a kick. We hunted the fields and easy stuff first, and as L.D. learned that we were willing to mix it up a little, we wandered into some brier patches and woods to find coveys that hadn’t seen dogs and shotguns in quite some time. The shooting was excellent. I was particularly proud of one shot I made at a single that had burrowed into some cover on the treeline. The bird flew high overhead and right into the sun. I didn’t even know I had hit it until L.D.’s pointer came to heel with the quail in its mouth. It was a nice finish to a great hunt and a satisfying end to a season that I thought had closed too soon. Next year things will be different…. 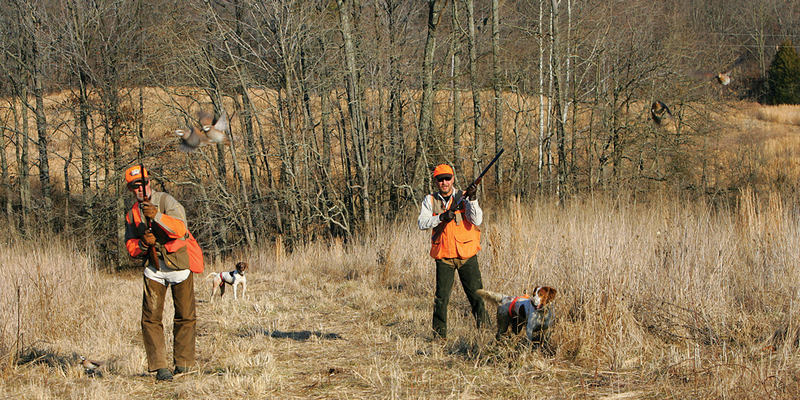 For more information on quail hunting in Kentucky, contact Wild Wing Lodge & Kennel, 270-965-0026. For information on e-collars, contact SportDog Brand, 800-732-0144.